Dudamobile mobile website platform includes features like one-click conversion to mobile, auto-syncing between standard site and mobile site, compatibility with all major smartphones, professional mobile site templates, click to call, maps and directions, and mobile site analytics. Customize up to 10 pages – Dudamobile helps keep your mobile site fresh so you can offer multiple options for your customers. Automatic syncing with your regular site – Dudamobile makes sure that any changes to your standard website will be reflected on your new mobile site. Dozens of great looking templates to choose from – Dudamobile has a variety of mobile website templates designed to WOW your customers. 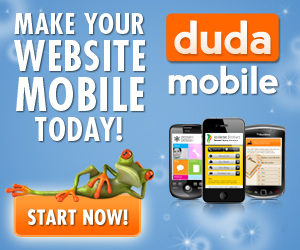 Dudamobile really makes it easy to get your mobile site up and running. Designed the way that you want because you get ultimate control of the appearance. Dudamobile will now turn over the process to you. Click the “Start editing my site” button. Select a layout and a color pallet and then click next. Once you are satisfied with your fine tuned mobile site, then it is time to go live. You can select the free option, or go with a very inexpensive premium plan. Finally, add a redirect to your website and away you go. You now have a mobile website. DudaMobile can be reached by the telephone by calling (866) 929-2177 from 6am to 6pm PST Monday through Friday. There is email support if your question is outside those business hours, to which DudaMobile will respond within 24 hours. The best resources are located in the DudaMobile Support page, which contains help and tutorial sections. Another option is to submit a ticket so that support can help you solve any additional issues. This DudaMobile review was to explain how you can easily create fantastic mobile web site design. You can create the site yourself, or use the Hire a Pro option where you can just sit back and let someone from the DudaMobile design team take care it for you.